Need a new roof fitted or your existing one repaired urgently at an affordable and competitive price? 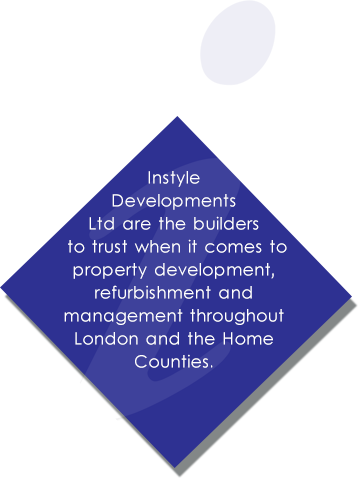 Speak to the property development and refurbishment experts at Instyle Developments today. Working throughout London, Kent and the Home Counties, we utilise decades of industry experience to provide a truly comprehensive roofing service. Offering everything from design and sourcing of the materials to the installation itself, we assist home owners and commercial business owners in enhancing their property's appearance and improving the protection of the building in the process. Call us today on 020 8300 8200 to arrange for one of our friendly and extensively experienced roofers to visit your property, carry out a FREE survey and give you a no obligation quotation. As one of the region's leading property development specialists, we have access to the finest roofing equipment and materials and utilise these in every project we undertake. Ensuring a safe, reliable and cost effective new roof is always our main priority, so you can rest assured that your new roof will provide you with effective and comprehensive protection from the elements and enhanced heating insulation for many years to come. Every client is different, with varying deadlines and restrictions when it comes to the required finish time and available budget. Experienced in a variety of different property development fields, we always make sure that every roofing project is completed to the very highest standards we expect and, just as importantly, on time and within the agreed budget parameters. When a roof develops a fault or suffers damage, it is imperative that the situation is dealt with quickly and effectively. If you spot a problem with your roof, no matter if we installed it or not, call us on 020 8300 8200 and we will dispatch one of our highly skilled roofers to resolve the problem as soon as possible. Based in London, we provide home owners and commercial businesses from across London, Kent and the Home Counties with the very best in roofing installation, repair and maintenance. We have recently completed roofing projects for clients in Watford, Stratford, Kensington, Orpington, Chelmsford, Reigate, Colchester, Redhill, Enfield, Chelsea, Victoria, Romford, Barnet, Bromley, Stevenage, Putney, Guildford, Greenwich, Croydon, Lewisham, Slough and Islington. For further information about our roofing installation and repair services, please contact us. One of our friendly staff will be on hand to answer any questions and arrange your free survey and no obligation quotation.